The Slovak National Uprising (SNP) is an important chapter in the modern history of Banská Bystrica. The armed revolt of the Slovak nation against the Fascist regime broke out on 29 August 1944 in Banská Bystrica. After a brief success the uprising was forcibly crushed. The insurgents retired to the mountains and from there continued their guerrilla warfare. 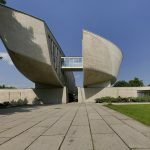 On the occasion of the 25th anniversary of the Slovak National Uprising a modern architectural monument was built at the very edge of the historic city centre in 1969, designed by the architect Dusan Kuzma, collaborating with the sculptor J Jankovič. The emotive-looking, sculpturally-conceived construction is made of two unequally-sized special segments of concrete, linked with a glassed-in communication bridge. The structure offers exhibition spaces for the Museum of the Slovak National Uprising and its administrative office area. 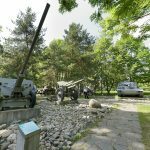 An exposition of heavy combat vehicles used during the uprising is located within the monument’s grounds.